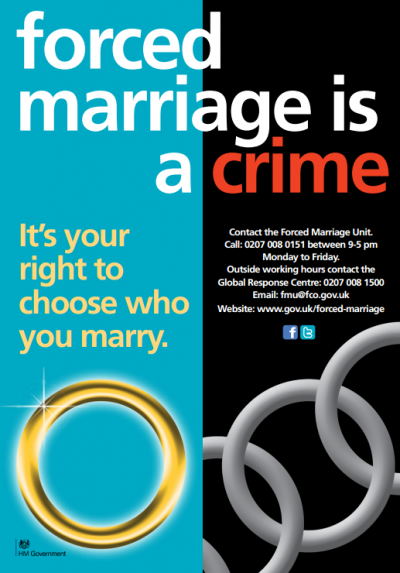 The government’s Forced Marriage Unit (FMU) has launched their summer campaign against the abuse that is forced marriage. It will run from the 12th until the 22nd, which is in time to target the spike summer period where families use the opportunity of the long holiday to take individuals overseas for marriages. The FMU will be using this time to make potential victims aware of the risks, and potential perpetrators aware of the consequences. It has also commissioned 3 short videos, which will be posted throughout the next few days, to highlight the increased reports of forced marriage during this time of year. These videos show how to spot the signs of forced marriage and focus on 3 young people all affected by these issues.